Who is Novecento? Born on The Virginian, a cruise liner that he has never left, he is probably the abandoned child of poor Europeans emigrating from Europe to America. Adopted by the ship crew he grows up in this early 20th century microcosm that gathers social backgrounds and nationalities from both continents. 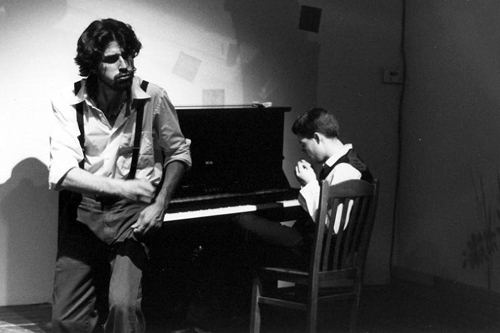 Now 30, Novecento is a pianist virtuoso who creates music that he only is capable of playing. Novecento : pianiste is the first theatre monologue written by Alessandro Baricco. Since its creation for the Asti Festival (Italy) in 1994 this monologue designed as a contemporary musical tale has been played widely by different companies and in various forms. Adapted, shortened, illustrated, this versatile text was ideal for Collectif Blauw to express their creativity. A show presented on the occasion of the ’Semaine de la Francophonie’ from 16 to 24 March 2013, a week of events celebrating the French language all around the World.